Jordan Rae Kelly is a Senior Managing Director in FTI Consulting’s Cybersecurity practice and is based in Washington, D.C. Ms. Kelly has more than 12 years of experience managing cyber policy planning and coordinating incident response. Ms. Kelly joins FTI Consulting from the U.S. Government, where she served as the Director for Cyber Incident Response on the National Security Council at the White House. During her tenure there, she was responsible for both national incident response coordination, as well as management of the U.S. Government’s process for managing zero-day exploits. She was also a chief author of the National Cyber Strategy, the first of its kind in the United States in 15 years. Before joining the National Security Council in 2017, Ms. Kelly served as Chief of Staff and Chief of Strategic Initiatives in the Federal Bureau of Investigation’s (FBI) Cyber Division, where she managed daily operations and strategic and policy planning for the FBI’s national cyber program. 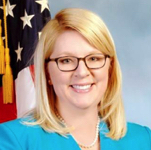 Prior to her 10-year tenure at the FBI, she was a law clerk in the Office of General Counsel at the Y-12 National Security Complex, a Department of Energy facility in Tennessee. Ms. Kelly holds a bachelor’s degree in English Literature from Wake Forest University and a Juris Doctorate from the University of Tennessee College of Law, where she served as an author and editor for Transactions: The Tennessee Journal of Business Law.